The GP330SCHHB is a rechargeable nickel metal hydride battery and is a cylindrical SUB C in size. Note these cells are flat top industrial cells and are designed for battery packs. The HB suffix designates OPPOSING TABS . These batteries are made to the highest quality standards and have the additional benefit of being qualified to the UL standard for product safety. This makes them the ideal choice when you are using these cells in battery packs. It is not recommended to solder directly to the battery, hence the addition flexible solder tabs is required . Please note that if you require any other specific tabs or you need any advice then please do not hesitate to contact us. 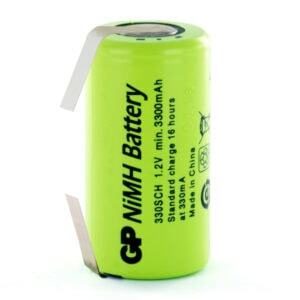 The cells are nominally 1.2v, have a typical capacity of 3300mAh, with a minimum capacity of 3430mAh. They can tolerate discharge currents of between 330mA and upto 30A and should give you around 500 charge and discharge cycles. A comprehensive technical datasheet and Material Safety a Data Sheet is available to download. They are a good choice for High drain fast charge applications. Please note that delivery times on tagged items will be based on after we have tagged the product so please allow a few working days extra on any delivery dates quoted. These were replacements for a hand held Hoover wet/dry vacuum cleaner. They arrived very promptly and worked fine when installed.